For best results, correctly size your rotator images before uploading them into the Home Rotator. A rotator is a series of images, usually between three and six, that rotate around like a slideshow. In order to implement a rotator, you first must create a rotator. Name your rotator and choose the transition time. You can then assign the rotator to a page right away or you can leave this part blank if you want to add it later. The rotator created below would be assigned to my home page once I hit save. Each step 1-5 correlates with 1-5 in the image below. 1. Enter in the first image or video you would like to appear on your rotator. 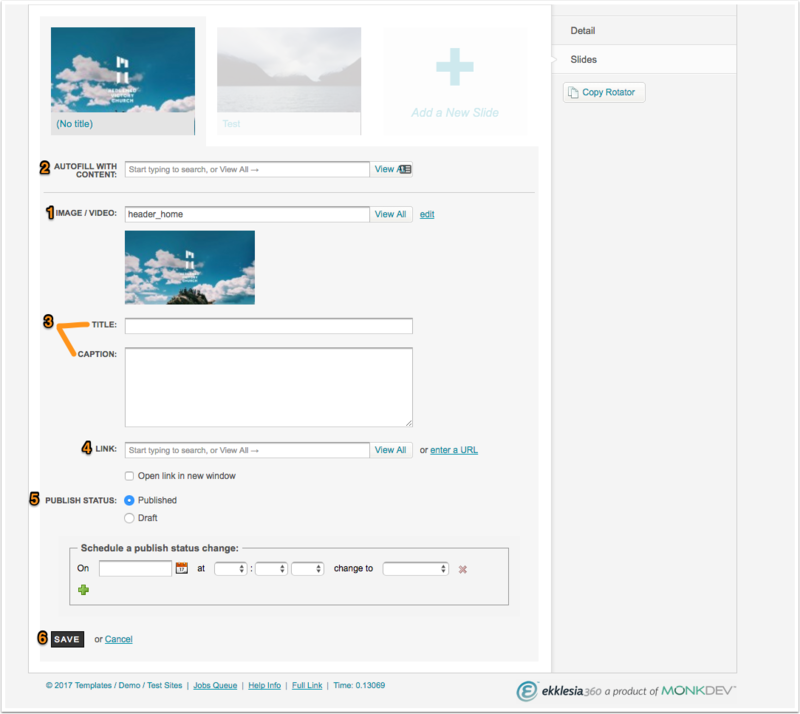 Each slider requires a Image/Video and the image/video must be already uploaded into your media files. 2. If you have a page/event/sermon/etc. that this slide is about, you can select that page to autofill all the information in step three. This step is optional and you can instead just fill in the information manually in step three. 3. The Title & Caption fields are not used in this theme so you can leave them blank. 4. The Link filed is where you can designate where the person will be taken to if they click on the slide. Click "Open link in new window" if you want the user to be taken to a new window when they click on the slide. 5. If you publish the slide it will immediately be shown on any page that implements this rotator. You can also choose to publish slides at a later date by filling in "Schedule a publish status change". This option is useful if you are currently using the rotator, but do not want a certain slide to show up until a later date. 6. Save your slide! Follow steps 1-5 for all additional slides you would like to add to your rotator. 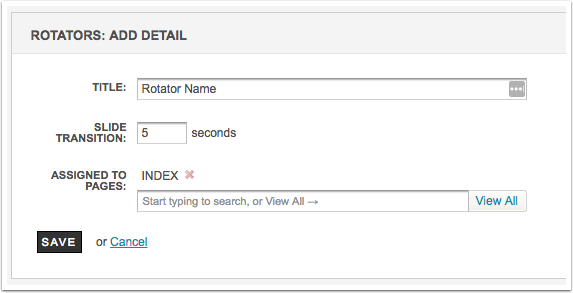 If you wish to add the rotator to a page that you did not add in the beginning then click to that page and add the rotator in the field "Rotator". The home page rotator images have a recommended image size of 1600 pixels wide by 900 pixels in height. If a slide has a caption this will display as a Heading 4 tag over the image. Note: If there is a Background Video in use on a page then a rotator will not show up. You must delete the Background Video in order to use the Rotator.